The timer goes down quickly for the first two runs, but the timer increases quickly. I don’t know yet if this trend continues or whether it is some random thing, I will update as soon as I know more. UPDATE: From 2-3 days of testing, it seems the timer is set randomly, with a max of 58 minutes so far for me. Prizes for longer waits do not seem to be better in any way; it is usually 1-5k rss or bilbo glass. 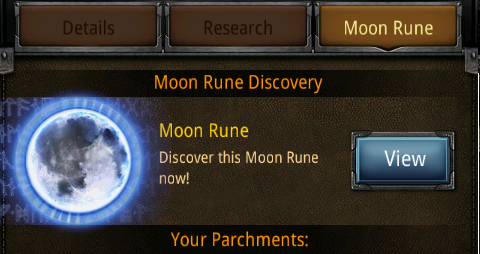 Additionally, the moon rune page mentions parchments…I have no clue what they do, but I presume you will win these eventually. Once again, I will update this post as soon as I find out! 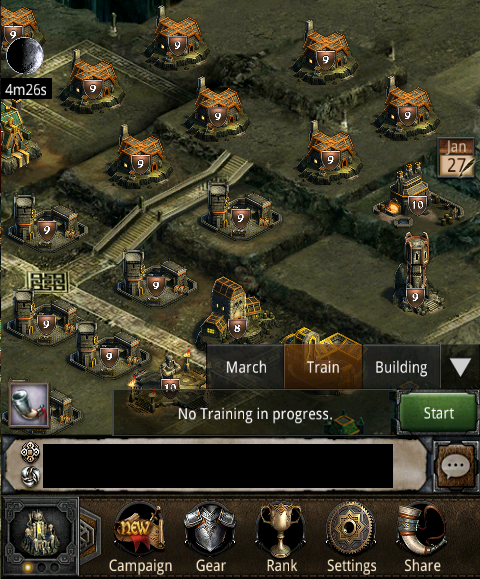 The game as a whole got much slower….screens load slower for example (try campaign). Cannot confirm whether this is hardware or software issue. Lag has also increased. I have had an annoying amount of “campaign attack is still underway” messages in campaign, forcing to either force-refresh or re-enter campaign mode. Only occasionally could I press OK and it would go the next try. Chat is no longer caching messages one at a time, but instantly loads all missed and available chat at once. This is annoying as well, because the chat jumps to the bottom newest message instantly/constantly, making reading older messages by scrolling up particularly difficult. Before, slightly scrolling the chat screen was enough to hold of the caching of new messages…..no longer…. Perhaps most annoyingly is the fact that pressing the back-button on your phone exits most game menu’s back to the city view. Before, in for example the mail screen, if you pressed back on an opened mail it got you back to your inbox or where ever the message was located. Now, city view. Same for many menu’s. Seems KABAM wants to force you to use the ingame back button, which is, you guessed it, annoying. That’s all for now, stay tuned for more updates coming soon! 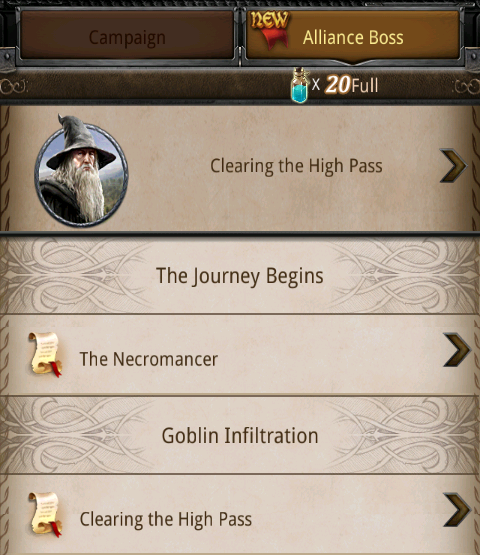 This entry was posted in Blog, General and tagged 9.1.0, campaign boss battle, campaign button, full moon, game, gear button, grpahics, icon, kabam, kingdoms of middle earth, KoM, moon rune, parchments, update by beardmonkey. Bookmark the permalink. no update for Kindle Fire HD users! Interesting. Either updates are platform specific, but as updates introduce new features such as boss battles, I think it more likely the different platforms have different update dates. Tell me, can you do boss battles yet? I’ve played KoM a long time as well as KoC for a year b4 that and with this new update there seems to be some issues. One being the chat seems to “skip” rather than “scroll” which is annoying and the game in its entirety seems to lag. Also alli member whom I concider Tk pros r commenting that hits seem to not add up correct under their calculations. Have u heard anything about this or know if Kabam possibly has changed their ways they calculate battle wins/loses? Or is it just a glitch they need to fix? Ill add notes for the non-gameplay related issues. As per the battle statistics, I have not seen any strange things yet nor heard of. Ill keep my eyes and ears open for news. Thanks!